The day after it played host to a concert celebrating Israel’s victory at the Eurovision Song Contest, at which Netta Barzilai performed her winning song ‘Toy’, Rabin Square in Tel Aviv was filled with different kinds of toys: ‘Playing in the city’, a three-day event showcasing innovative play equipment from around the world, organised through the Bernard van Leer Foundation’s Urban95 programme. Set up to encourage imaginative interactions between parents and children, the event proved highly popular, attracting around two thousand people on each of its three days. It was attended by the Mayor and covered in news outlets such as Haaretz. The play elements piloted at the event included sand benches, imagination playground activities, playworkers and toy storage sheds. They will now be taken to similar events in poorer sections of the city – South Tel Aviv, home to a large population of asylum seekers, and the mostly Arab area of Yafo – before being distributed throughout the city in parks. 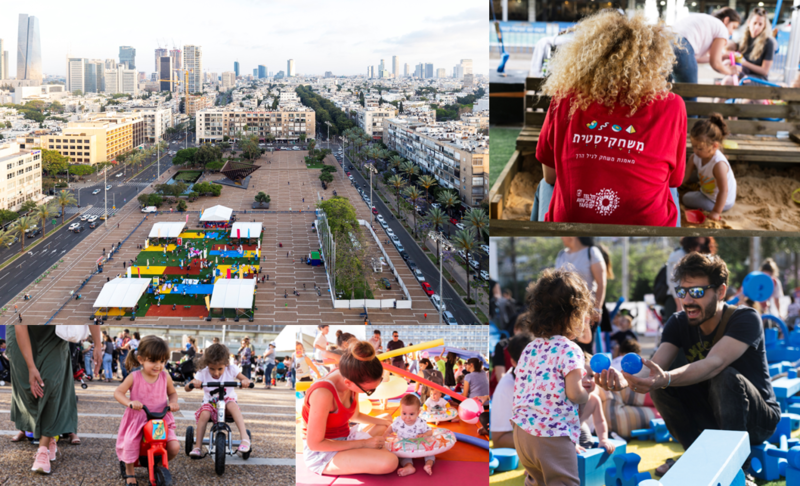 The Urban95 programme in the Municipality of Tel Aviv-Yafo is led by the Community Administration department and cuts across the city government, with the support of the Bernard van Leer Foundation in collaboration with the Tel Aviv Foundation. It encourages the needs of young children and their caregivers to be taken into account in all aspects of city life. At a recent half-day conference, with the participation of 160 municipal staff, the Urban95 strategy was presented and employees from a range of departments (including education, social services, transportation, engineering, construction, operations, community, the spokesperson’s office and Tel Aviv Global) discussed ideas for implementation. “Urban95 is not just a programme,” said the Director-General of the Municipality of Tel Aviv-Yafo, opening the conference, “but should be a way of life in our city, that is the goal”.